Neither Jeff nor I stirred until almost noon today. Maybe we’re not astronaut material, but I still think I would’ve made a good Viking. After the nice lie in, I enjoyed a refreshing shower in the most awesome shower in all of Iceland (in my experience). It had one wall of windows with a view out on the snow covered hills, fjord and surrounding city. It may have been a nice view (or a wretched one) for someone looking in, but that’s what you get for looking. I keep kicking myself for not taking a picture of it. It was way beyond fabulous. After we got dressed we headed out for some lunch. Once we had eaten, we decided to climb the icy steps to the renowned Akureyrarkirkja or the Church of Akureyri. Total stair count 111. Not quite St. Paul’s Cathedral, but it did have the added degree of winter weather difficulty. 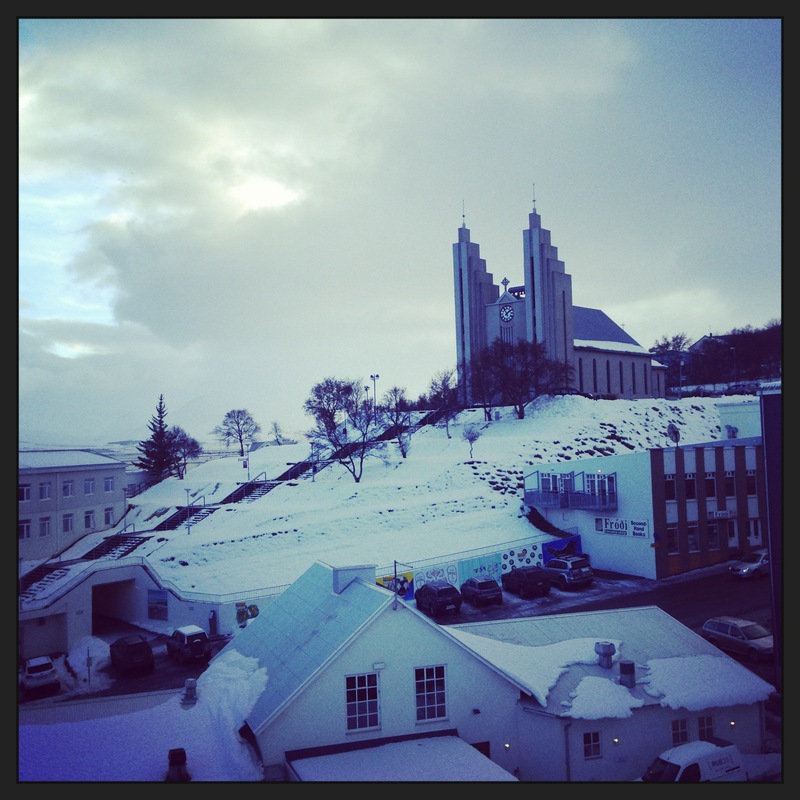 Akureyrarkirkja is a Lutheran church that sits prominently on the hill above the fjord. It was built in 1940. I wanted to check out the stained glass window that was “stolen” (perhaps bought at a flea market) from Coventry Church in England after WWII air raids, but it was only viewable from inside and the church was locked up tight. Jeff and I met back up at the hotel for our “free” welcome drink that we missed the night before and then had dinner at the hotel restaurant, Aurora. I had deep fried Camembert cheese with banana bread and Icelandic blueberries. Yes, for dinner! Who knew it could be so damn good? De-lish. We were scheduled to try again for the Northern Lights, so after dinner we layered on our warm clothes and tromped down to the lobby to meet the tour group. It turns out that the bus was full so we were able to get in a mini bus with the same group from yesterday’s tour – minus Gísli. It was nice because we had become familiar with each other and had a nice chemistry. We all piled on the mini bus and set out of the light-polluted town in search of a break in the snow clouds and another chance at seeing the Aurora Borealis. It was close to midnight and we had almost given up when our driver decided it was time to serve the cocoa. A few of us climbed out to help and there they were, dancing across the sky! It was a fabulous experience made even more dramatic by the sparkling stars, drifting snow and the crashing waves below. We sipped our cocoa and took it all in. Most of us tried in vain to get photos before deciding that the mental pictures were going to serve us best. We had had a successful night so we all headed back to the hotel to get some sleep before most of us were bound for an early morning flight back to Reykjavik.